In an animation studio, there are usually several people using Harmony who will probably be assigned different tasks, such as ink and paint or compositing. Normally, you should create a different user for each one. 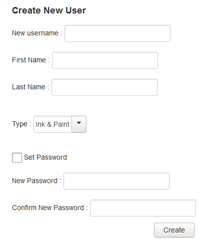 This way, the person assigned to ink and paint will only have access to the Paint module and not to other features that are not relevant to their work. Anyone who uses Harmony must have a login name in order to run any of the modules. When using Harmony in standalone mode, there are no username or password required. The Harmony login is independent from the computer session login. Users connecting to the database through Web Control Center should have a password as it's safer for accessing via the Internet. For Web Control Center users, it is recommended to create the users through Web Control Center so you can set the password. On Windows, by default, only the usabatch and BATCH users are created. However, you should not use them for your staff. These should be kept for Harmony Server when performing background operations, such as batch processing—see Creating a Default User for Batch Processing. IMPORTANT: Before making the Web Control Center public, set passwords for all users so no one can delete everything. The User List dialog box lists all the users and their details, including: username, first and last names, and user type. The buttons at the bottom of the dialog box let you add, delete or modify the list of users. Each login also has a user "type" assigned to it which allows access to only some of the Harmony modules. As your studio network grows and evolves, you may need to delete old or obsolete user profiles from your system. After you delete a user profile, the person who used that profile will no longer be able to access Harmony. You cannot delete yourself from the user list. If you accidentally delete a name, you must follow the procedures for adding a user to get the name back into the system. NOTE: NOTE: To change your own user profile, login as usabatch (the default user). From the top menu, select Admin > Users. The User List dialog box opens and displays your login name and a list of the other users in the system. To view the list of users, select Admin > Users. In the user list, select the name you want to delete. Confirm if you want to delete the user from Harmony. The User List dialog box displays. Select the profile to modify.